Homemortgage.net, with a network of mortgage lenders for those looking to buy a home, refinance their home, or obtain a home equity line of credit, has launched their website to help visitors shop for mortgages. “At Homemortgage.net, we want consumers to feel comfortable to uncover all the mortgage resources and tips that we provide and for their mortgage shopping experience to be as simple as possible,” says account manager Rob Karaguezian. The website connects interested visitors with potential lenders who make conditional loan offers and also provides visitors with general information about mortgages, home maintenance, refinancing, and mortgage news. The purpose of the website is to help visitors determine what kind of mortgage they should apply for by teaching them about different types of mortgages, the set-up of a typical mortgage payment, etc. Once visitors feel informed, they fill out a short form and are connected with interested lenders who may contact them and present them with conditional loan offers for mortgages, refinances, or home equity loans or lines of credit. 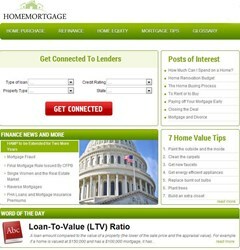 Ultimately Homemortgage.net is a place for visitors to connect with lenders in an easy to use hassle free environment. It is a marketplace where home buyers or refinancers can shop around for mortgage quotes with different lenders. Homemortgage.net helps connect consumers with a network of mortgage lenders. The site also features extensive resources to educate and guide home buyers and refinancers through each process.